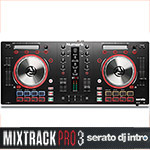 Featuring four decks of complete DJ software control, with timecode capability. 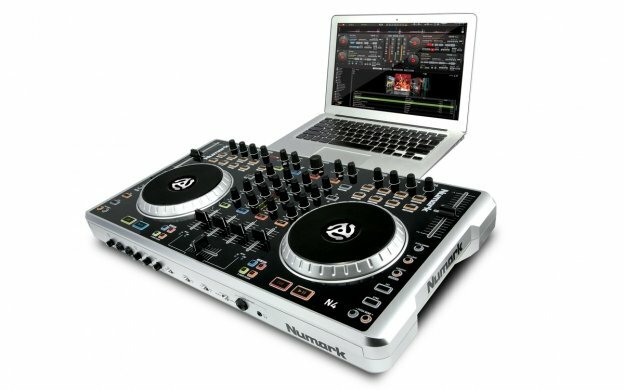 The Numark N4 is the latest in DJ software control technology. 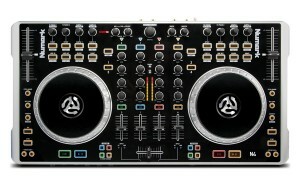 The N4 features four decks of software control, plus a built-in mixer that can be used with or without a computer. This complete DJ controller has everything you need for peak performance including large, touch-sensitive platters, four decks of software control that have loop and effects operation, a built-in USB audio interface and a comprehensive mixer with both EQ and gain controls for each channel. The N4 also includes a copy of both Serato DJ Intro and a 4-deck version of Virtual DJ LE so you can get the most out of the controller’s multiple mixing options. In addition to its four decks of MIDI software control, you get the ability to use CD players or turntables to control your advanced DJ software by employing turntables with time-coded vinyl or CD players with time-coded CDs. 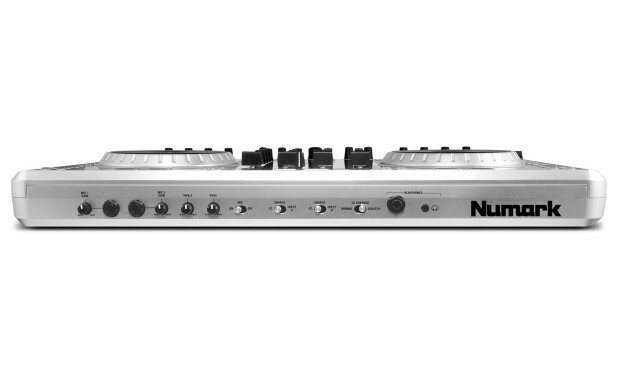 Turn N4 into a four-platter controller by adding on additional controllers, CD players, or turntables. N4 comes equipped with an intuitive layout of faders, knobs, and buttons that feel great, provide just the right amount of resistance, and are built to withstand abuse. Each deck is outfitted with standard DJ tools including a pitch fader with key-lock control, looping controls, and effect and sampling controls. Four Video Fade selectors are also on-board to give you video mixing capability when using Virtual DJ. N4 does not require any additional drivers to be installed, so just plug it in to your laptop, load the software and you're ready to go. N4 enables USB recording of all your analog and digital sources. Whether you're using four decks or software or combining software and externals sources from N4's mixer section, your entire performance can be recorded, saved and posted to your website or social media. For your live audience, N4 has balanced XLR outputs, giving you a solid, professional connection to virtually any sound system. *Note, you will need to upgrade to Virtual DJ Pro in order to use the N4 with time-coded vinyl or CD’s, and if you want to output full-screen video. 4-Deck controller and DJ Mixer that works with or without the computer, so you can just start mixing whenever and wherever you want to set up. External mixing (2 CD/Turntable + 2 Mic), will allow you to have multiple options when setting up your DJ rig. Built-in professional USB audio interface with balanced XLR outputs that will give you easy connection when setting up for live performances or in your home studio. 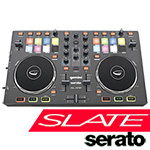 The two large, touch-sensitive control wheels will give you a hands-on approach to mixing your favorite music. 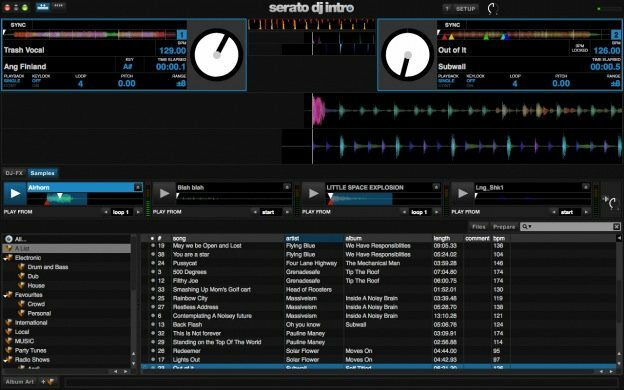 The included Serato DJ Intro and 4-Deck version of Virtual DJ LE software will give you access to all of the controller’s features, but you will need to upgrade to Virtual DJ Pro in order to use the N4 with time-coded vinyl or CD’s, and if you want to output full-screen video. The mixer section is built-in to the unit and includes EQ, loop and effects control features that will help you blend your mixes smooth and with added style. 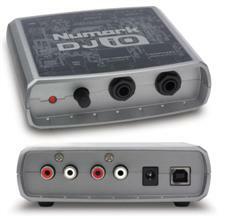 Start having more options in your digital mixing with N4 from Numark.